Wilson sings at an artist showcase. Photo by Leon Laing. Local promoter Denm Inc. held R&B Divas Unplugged on June 29. 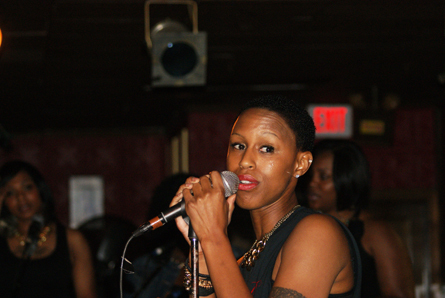 The local artist showcase took place at Gullifty’s in Camp Hill. With good song choices and impressive vocals, Wilson gave a successful set. Some of the highlights of her set included a performance of Elle Varner’s hit single “Refill.” Hitting notes from the song’s chorus can be daunting, but Wilson nailed it. And when she sang Beyonce’s “Party,” she was able to convey positive vibes like B. did. This is the first story of a three-part series.